If you are concerned about any of these matters, you may wish to seek advice from a solicitor or the Citizen’s Advice Bureau. 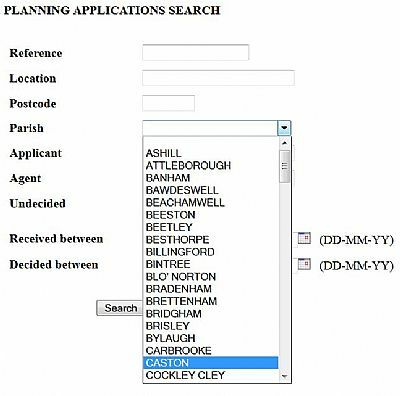 to see Breckland's Planni ng Applications for Caston. Includes applications awaiting planning decisions as well as decisions made along with the notes of the planning officer and the reasons for the decisions. Then follow this simple procedure. 1. Click on the drop down box and choose Caston as shown. 2. Click the Search button to reveal the full list. You can click on any text shown in blue and underlined. If you wish you can also make comment on-line to Breckland if you have concerns or if you wish to add approval to any planning application. An individual neighbour comment will carry far more weight than a petition signed by many. You may also lobby members of the parish council, their contact details are here You may additionally lobby members of Breckland's Planning Committee whose contact details are here. A telephone call and/or a personal email to individual members can have considerable influence. The Planning process is established, IN THE PUBLIC INTEREST, to protect the public from the unacceptable activities of the private individual. Unless there are special reasons to do otherwise, planning permissions "run with the land", and are NOT personal licences. Planning is primarily concerned with issues of land use, and the way uses, and development affect the environment. The factors to be used in determining applications will relate to the effect on the "public at large", and will NOT be those which refer to private interests. Neighbour disputes often relate to "spoiling my view", or "interfering with my light". These are PRIVATE matters, and will not figure in the assessment of the application. Similarly, the personal circumstances of applicants "will rarely" be an influencing factor, and then, only when the planning issues are "finely balanced". "The applicant worked hard for the village"
"The applicant's family was brought up here"
"The applicant's daughter is very ill"
Factors which are controlled by other legislation and by other bodies should not be used in weighing the balance of "pros and cons" in a case.